We've had snow again these last couple of days. Not a lot. But enough to cover up the ice on the trails. And definitely enough to go skiing. I love a sunny, crisp winter's day. 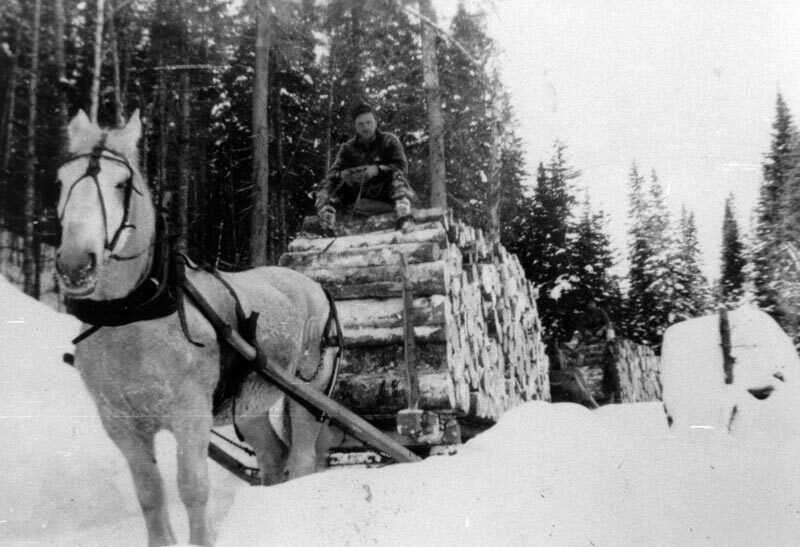 And being in the woods in the winter, always reminds me of my brief career as a logger. Okay, so, not exactly a logger, more of a logger's helper. Kind of. Let me explain. When we first moved to the farm, after my mum and my stepfather married, I was entranced by everything. The farmhouse, the brook, the hills and fields, the treasures I unearthed in the old cellar or under the woodpile behind the barn. I wrote a post about that a year or so ago; you can read it here, if you're interested. Our farm had, like many farms, a large woodlot. And my stepfather worked in the woods, for a few weeks each winter, cutting logs, some for firewood for the kitchen wood stove, and some to sell. He loved to be in the woods. Especially in the winter. Especially with his horses. Usually he would harness Myrt to the sled... that's her on the left... she was lovely, wasn't she... and he'd set off early in the morning, for the whole day. Returning in the late afternoon dusk, in time for supper. That first winter after we moved to the farm, when my stepfather came home from the woods, I'd quiz him at supper about his day. Where had he cut? How did he get Myrt to help drag the logs? What did he do at lunchtime? And his stories of the day caught my imagination. How he had built a big fire, and kept it going all day. How, when he stopped to have a bite to eat, he'd sit down on a log and get warm at the same time. How he boiled some snow in a kettle on the fire and made a pot of tea. All these details stirred my little romantic heart. "Wouldn't it be good," I asked my stepdad, "To have someone to tend the fire and make the tea?" And, of course, he allowed as how my services would be indispensable. So, I awoke early the next morning, donned my step-brother's one-piece snowmobile suit, and set off with my stepdad for a day in the woods. We had a lovely day that I have never forgotten. We built a fire. I added scrap wood to keep it going all morning. 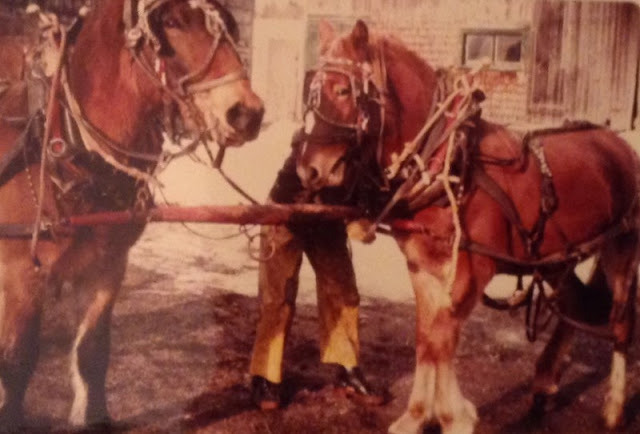 Sometimes I held the horse when he needed to be doing something like shifting a big log, and rolling it onto the pile. At noon we boiled water for tea. I have never drunk tea that tasted more wonderful. He said it must have been the ashes that blew into the open pot. Then we opened the packet of sandwiches that Mum had made for us. Homemade bread, bologna, and cheese. He showed me how to take a forked stick, place the sandwich across it, and toast it over the fire. They tasted wonderful too. And after lunch he cut a few more logs, Myrt pulled them into the small "yard" he had cleared, and I helped pile them. And then when the shadows fell across the track, we headed for home. He hooked Myrt up to the sled, and stood with the reins in his hands, urging her along, and I sat on the back of the sled and tried to stay awake. I must have told an enticing tale at supper of our day in the woods: the sunshine, the fresh air, the fire, the tea and toasted sandwiches. Because the next morning, my stepbrother, two years younger than me, who had been born on the farm, and had previously viewed logging with a certain amount of disdain, as just something his dad did every year, and not how he wanted to spend his school holiday... had a change of heart. Afraid that he'd been missing something all along, he was awake before me, and sitting in the kitchen wearing his snowmobile suit, all ready for a day in the woods, when I came down for breakfast. Looking back I'm sure my parents must have been quite amused by the sudden popularity of logging in our house. 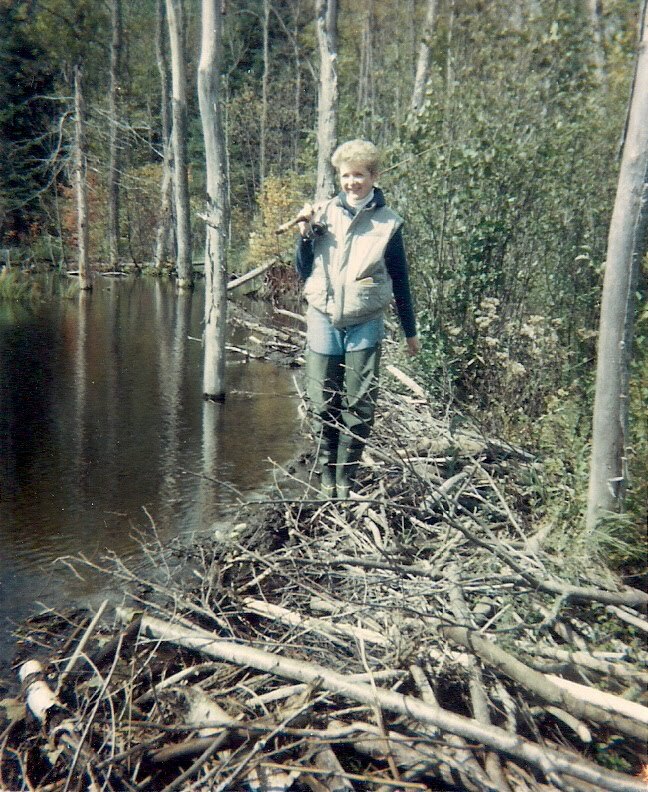 I used to love to listen to my stepfather tell stories of working in the woods when he was young, big gangs of men lived all winter in the bush, housed in shanties, cutting all day. I remember drinking tea one Sunday afternoon and listening as he and our neighbour told of working in the backwoods of Maine one winter. And of the time the cook quit half-way through the cutting season, and my stepdad had to stand in temporarily. No small feat keeping fifty men fed, the secret apparently being beans, bacon, and biscuits. What? No toasted sandwiches over the fire? The men would cut all winter and pile the logs, and then in the spring, there would be the drive. Logs sent downstream on creeks and rivers swollen from the spring run-off. Floated downstream until they could be gathered in huge booms, and lashed together into rafts, and thus continue further downstream to the mills. I remember as kids we even learned to sing a song in school about the log drive..."Down, down, the river Saint John... something, something." It was a dangerous business working on the log drive. 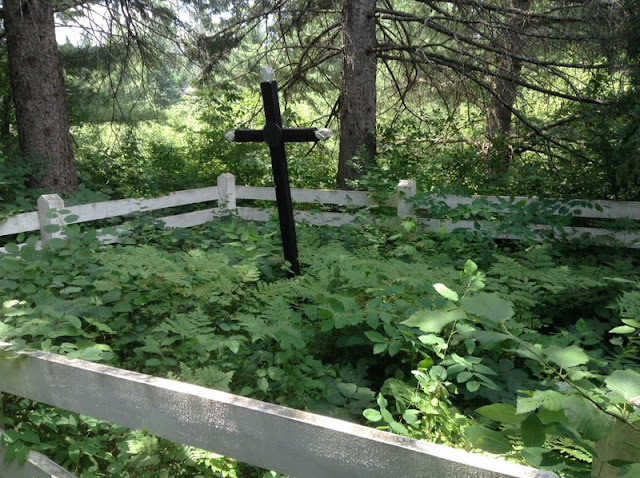 The shot below is of a small fenced graveyard that Hubby and I discovered one summer when we were fishing on the Bonnechere River, in Ontario. Not far from the banks of the river, it's surrounded by encroaching bush and seemingly forgotten. According to local history, it marks the graves of several log drivers who died one spring in the 1890's. Their names are not recorded. Fenced in grave site of river drivers killed in the spring log drive on the Bonnechere River. And have a look at this little film created by the brilliant people at the Canadian National Film Board. They really do make the best animated short films in the world. I've been singing the song on my head for days. The music is by Canadian singing sister duo Anna and Kate McGarrigle. If you get a chance check out more of the McGarrigle Sister's work. I love them. Sadly Kate died in 2010. 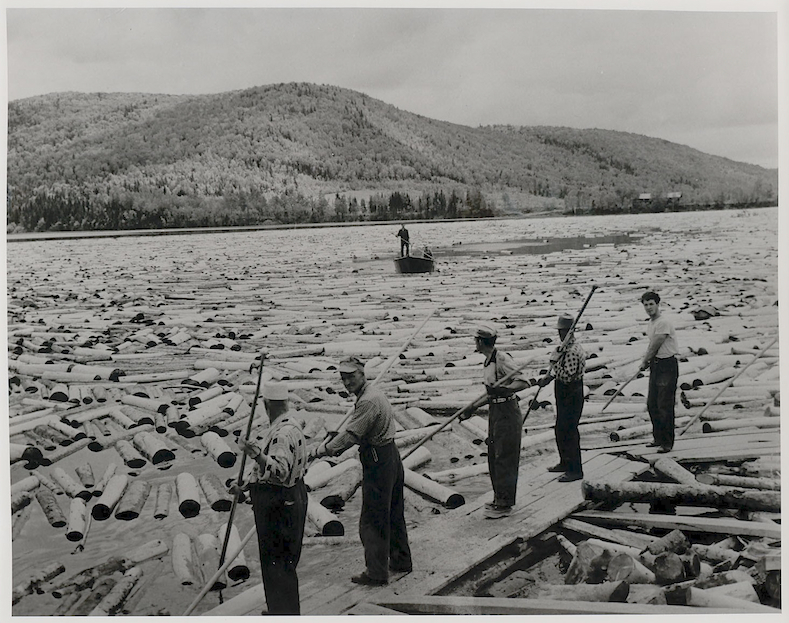 Logging is a big part of the history of many areas of Canada. It was a big part of my stepfather's life. And a small, but treasured, part of mine. So now, whenever Hubby and I are out in the woods in winter, part of me really wants to build a fire, toast some bologna and cheese sandwiches, and put the kettle on for tea. But I usually settle for a thermos. What about you dear readers? What memories does a sunny winter day conjure up for you? So glad to see that you haven't given up on me! I wondered if you were travelling or somewhere in deepest Scotland without internet access. About the disappearing comment thing. I spent some time yesterday trying to research how and why comments can disappear like that. It happens to me too on some blogs. It seems that on my blog "anonymous" comments and "name/URL" comments require the "I'm not a robot" Captcha verification. I've read that this has appeared on other Blogger sites and I'm not sure how to get rid of it, even I even can get rid of it. Some computers which have had undated security settings see the pop-up Captcha window as spam and block it. If you don't see the Captcha prompt the comment will not go through. Apparently you need to make sure that your computer is "third part cookies" enabled. The article I read said that "cookies" do not and cannot contain Malware and people should not be afraid to enable them. This might be the reason you can't always make comments. I need to try to do this on my new computer which has different security settings from my old one. Once I can figure out how to do this, I'll put it on the blog. You're not the only one who has had problems. The article also said that sketchy internet service will not allow comments to come through, either. My stepdad was a lovely man indeed. My mum called me after I wrote that post and said, laughingly, "You're turning him into quite the character." But it's all true. He was the strongest, most patient person I've ever met. I know that his ancestry is Scottish (McGibbon was his last name) and that his ancestors emigrated to Canada in the United Empire Loyalist migration from the States, He always treasured his copy of the original land grant from the 1700's for a piece of property a few miles away from our farm. Lovely story. I remember seeing large booms of logs when I lived in Canada in the 70's. When did they stop doing this and how do they move the logs now? I think that they truck most of the logs now. I remember the huge booms from the 70's too. But I don't remember when I stopped seeing them. I'll have to research that. Love your stories about the farm and the 'old days'! Ah, thanks Patricia. Obviously I love telling them. Thanks, Jenn. I just love draft horses...there's something so noble and patient about them. Loved this post. I can feel your excitement. You're gifted. I too love your stories about the farm, your stepfather and winter. They remind me a bit of times I spent on my grandparents' farm in central Alberta. I was raised, and have returned to live, in western Oregon, which also was logging country until recently. 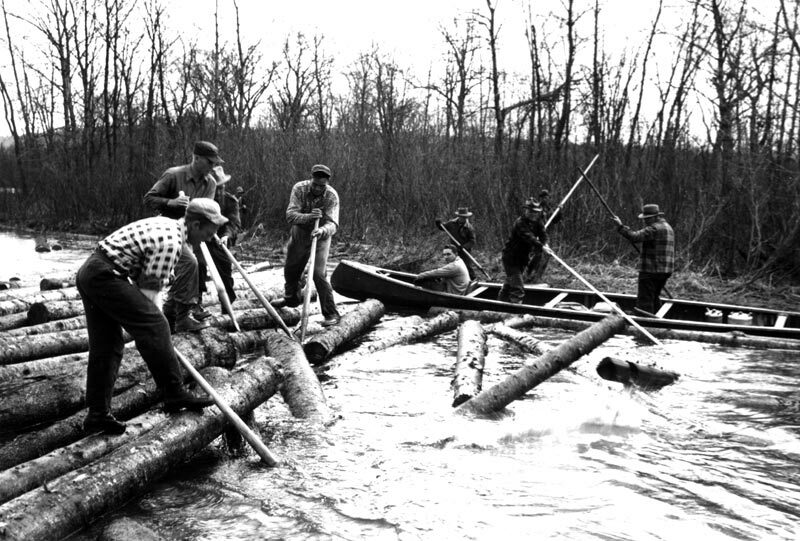 My vision of log driving has been clouded ever since I long ago watched the scene, in the film "Sometimes a Great Notion," of the slow, tortuous drowning of a log driver who became snagged and trapped in a rising tidal river in coastal Oreogn. Thanks to you, I will try to replace that nightmare memory with the rousing "Log Driver's Waltz" video. As for memories of a sunny winter day in the snow: regrettably, I have few memories of working in the snow, as I did not get to spend any winters in Canada after I was a baby. I do live near the Cascade Range and have spent many a happy day with family, friends and dogs cross-country skiing (and, before we had dogs, downhill skiing). I love being outside in snow more than just about anything and try to visit snowy places as often as possible! Thanks, Leslie. I was telling my husband about your comment and he said he thought he'd seen that movie too...years ago. He retold the plot and we looked it up to see if he was correct...yep...same movie. Funny, that. There's just something about physical activity on a snowy winter's day, isn't there? Best thing ever. Well, except for the relaxing in front of the fire which comes after! 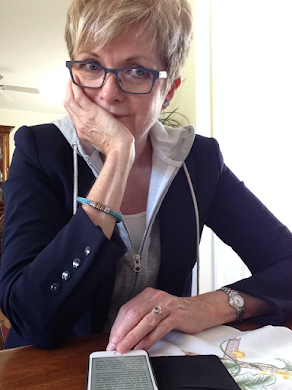 I love this post and read the 2014 post of the family treasures you inherited! What a wonderful childhood! I love the fact that you appreciate old things, too! So do I. My husband says that why I keep him around. :D.
Thanks, Charlene. Glad you liked the earlier post too. My husband is a few years older than me and he says the same thing. Great post -- so evocatively described, that scene of little girl and her (wonderful) stepdad. He sounds a real gem. I loved the McGarrigle Sisters as well, and love the rest of the family talent (Martha and Rufus Wainwright -- do you know their stuff?). He was a gem, that's for sure. I love Rufus Wainwright, although when I was writing this post I looked him up and he has lead a complex and not always easy life. That surprised me, his mum and aunt always seemed so sensible, and grounded. I heard Anna and Jane McGarrigle interviewed on CBC last week; they've written a book about their own lives and about Kate. Thanks. "Snow cream" that's a new one... was it something you and your grandmother dreamed up? What a magical,mythical almost, memory you have. I remember cartoons when I was little of loggers walking on floating logs and being so fascinated by that. Your experience was like those stories come to life. What memories do I have of winter days? Skiing. Skiing in Colorado since I've been knee high to that proverbial grasshopper. My mother packing salami, cheese, oranges and crackers in a plastic lined bag and burying it in the snow outside a ski lodge where we'd sit and eat lunch together - that and hot chocolate in a red and black plaid thermos. Those winter adventures, along with ice skating are near and dear to me and still make winter a favorite season. Salami, cheese, and oranges sound like a wonderful skiing lunch. There's something so convivial about winter sports, we often ski on trails near us which have log cabins where you can eat lunch, I love it when the fire in the wood stove is already roaring, and we can hand our our gloves and our jackets to warm while we eat. I enjoyed reading this when you first posted, and enjoyed just as much reading it again. You are a good storyteller! i'm a grade 8 student and i wanted to know if i could please use your pictures for a school project? Happiness Is ... What Exactly?